I have been looking for a wireless USB remote control for a long while. These are also referred to as long range presentation remote, which is useful for anyone who needs to control their computer from a distance. Currently, my desktop is hooked up to my 37” TV so when I want to relax in bed and watch Netflix or Youtube with minimum fuss, I would prefer to have a one-handed solution to be able to quickly change tabs or start and stop Youtube videos at my leisure. 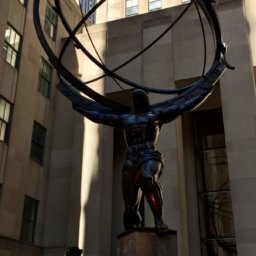 I need the best remote to work with both Android boxes and Windows with little to no setup on my part. On a related note, I do not have cable so all of my entertainment comes from various things on the internet so it is important that I have the same sort of comfort. To this end, I decided to buy and review three separate wireless remote controls all with different features and different price points. One of my deciding factors was that I didn’t want to spend more than $20 since I do have a wireless mouse and keyboard (Logitech MK270 Wireless Keyboard/Mouse Combo) and I was looking for a one-hand operation. Over the course of this post, I will show you the best USB remote out of the three I personally used over the last year. This section highlights the pros & cons of size, design choices, tactile feel, mouse and keyboard layouts for the USB remotes. Size is an important measurement to me regarding these USB remotes. It is important that the presentation remote is usable with one hand 90% of the time. When laying in bed and bed and watching Netflix, I don’t want to have to reach for the wireless keyboard or mouse to manage a simple pause or stop function. Size is only one part of the size and design section so let’s get started. Definitely one-handed operation. The smallest remote I purchased. Main buttons are located on the bottom left of the remote. Buttons are pretty decent to the touch, serviceable but definitely could be better. Power button, but it has to be specially programmed to each device. The buttons have too many labels such as a TAB button and a FOLDER icon for Windows. This leads to a lot of confusion when using the remote on another type of machine or looking for a different function. Most of the buttons are not initially programmed to do anything leading to confusion. The mouse knob is stiff and terrible to use. Mouse isn’t easy to turn on and off. No full-sized keyboard meaning I have to use an on-screen keyboard. The right side of the remote has the most used buttons (arrows and the OK button) which is perfect for me. Includes signal lights and low battery warning lights as well. The buttons on the keyboard are very stiff, especially the ones that are barely used. The buttons are made out of a hard plastic, similar to buttons on a computer keyboard but since they are so small, it makes them harder to press and annoying to use. The trackpad is a hard plastic as well so it doesn’t have the tactile feel of a trackpad that you would find on a laptop. I avoid using it at all because of this. Also, the trackpad seems to have issues with tracking finger movements leading to random stutters and is-swipes. The trackpad middle section is for fast scrolling, so it effectively divides the available space you have regarding normal swiping. The front of the August PCR500. 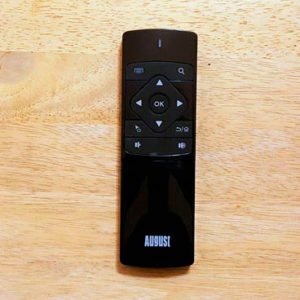 The size of this remote is close to a normal remote which ensures one-hand usage. Big buttons make it is easy to hit the key you want. On the backside of the remote, you have a standard keyboard layout. All of the soft buttons on the remote are great to the touch. The buttons feel like a decent TV remote which means it easy to use and press buttons. One button press to activate the mouse which allows you to move the remote in the air to control the mouse screen. It feels like a natural extension, similar the Nintendo Wii remote. When you press a button on the remote, the remote lights up near the top to signify that a signal was sent, similar to a standard TV/Cable remote. Doesn’t include any special buttons or functions which may not be supported on every machine. Personally, I haven’t noticed any negative size and/or design choices concerning this remote. You can buy the August PCR500 on Amazon here. 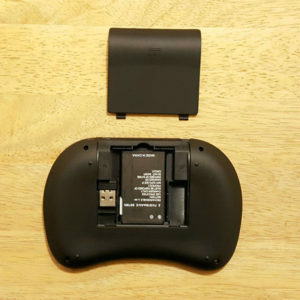 This section highlights the pros & cons of the battery and connection options for the USB remotes such as USB dongles, Bluetooth connections and/or rechargeable batteries. The connection seems to be strong when you point the remote directly at the dongle. Doesn’t need to be manually paired to the USB dongle, just plug it in and go. Uses a CR2025 coin battery (include aff link to CR2025) which is replaceable by the user but isn’t generally stocked at every store. 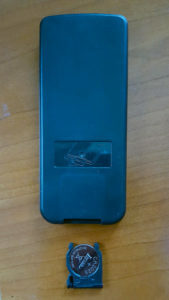 The USB dongle (include image of the dongle) includes a retractable cable which is only about 6-8 inches long in total. The retractable cable feels very cheap and if it breaks, you are SOL in terms of using that remote. The remote must be aimed directly at the dongle and not just in the general direction of the USB dongle receiver. Includes a rechargeable battery AND the necessary cable to recharge the device. 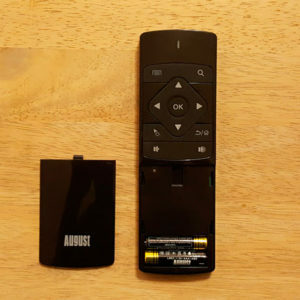 Includes a built-in storage area in the back of the remote to hold the USB receiver which is the standard size of these sort of devices (show the picture). The remote includes a sleep function to save battery. The remote has an on and off switch for when you know you aren’t going to use it for a while. You do not have to aim directly at the receiver which means being in the general area is acceptable for your devices. The rechargeable battery is specific to this remote so you can’t easily buy or swap it without doing some research first. No placing 2 AAA batteries to continue a marathon Netflix session. You do need to resync the remote the USB receiver sometimes, especially when setting it up for the first time. Sometimes that sleep functions mean you will have to hit a button a few times to wake it up. The August PCR500 with the battery cover open. This remote also comes with a standard size USB receiver. The remote uses 2 AAA batteries which are easily replaceable by sliding off the front cover. The remote comes with 2 generic AAA batteries. Pointing the remote in the general direction of the receiver, it was able to send the signal without any issue. Plug and Play setup. No additional action required. Again, I haven’t seen a downside to this remote regarding battery and connections. With the Battery & Connections section completed, again the August PCR500 seems to be the best USB remote, taking both this section and the Size & Design section. Let’s head into the last section of EASE OF USE & USABILITY which would cover day to day use of the remotes and any additional issues before delivering my final verdict. 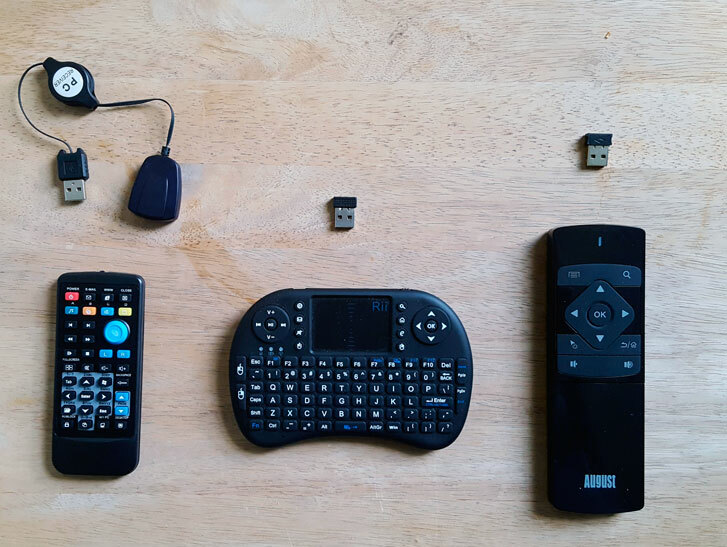 This section highlights the pros & cons of the usage and usability for the USB presentation remotes such as day to day use and issues. The signal never drops when using the remote. All buttons feel the same when using the remote in the dark leading to bad presses. Hard to use when in a relaxed position since the remote MUST be aimed at the USB dongle. Non-tech people would have an issue with using the remote due to the various labels on the buttons. Able to use it without aiming directly at the receiver. Feels comfortable in the hand when typing since you have to grip it properly. Better for typing compared to other general remote. For best use, its better to use two hands rather than one. 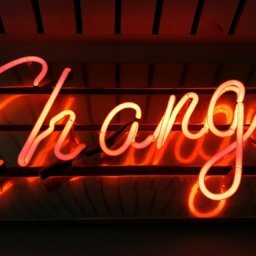 For non-technical people, you may have explain how to best use it. The keyboard is 80% of the product and the touchpad mouse navigation area is too small for those with bigger fingers. Easy to use in the dark due to simple remote-control style layout. 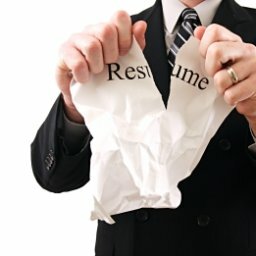 No learning curve. It is a remote after all. The signal is excellent. I can point the remote AWAY from the receiver and still have the signal go through. Rarely, the signal goes all wonky and you have to pull the batteries out of the remote to ‘reset’ it. This is rare, however. Based on the program you are using it for, some buttons may not have functions assigned. There doesn’t seem to be a way to “reprogram it” at this time. The August PCR500 USB Remote sweeps another category. For its simplistic design, it focuses on what actually matters in an affordable package. The most important things to me: a strong, reliable signal, easy to use in the dark, and simple enough that anyone can pick up and use it. Depending on what you are looking for out of a USB Presentation Remote, you really can’t go wrong with the August PCR500. It may not be much to look at but that’s exactly why you will have a reliable experience out of the device. The kids or your grandma can use it with a 2-minute demonstration. 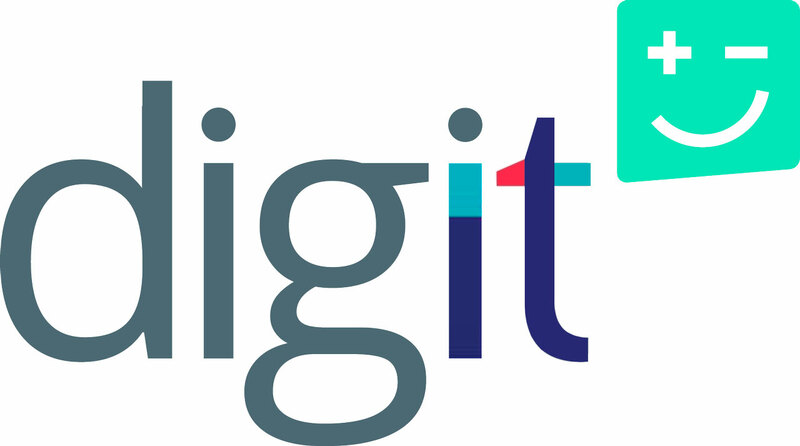 And since it is compatible with computers and laptops, iOS and Android boxes, I can see it easily finding a space in your rotation of devices. I have been faithfully using mine since January 2016. While the Rii i8 Mini has some nice features, it suffers in the usability department for my purposes. However that does not mean it is a bad USB remote, just that if you prefer this style remote over the August PCR500, why not give it a shot and see what happens? Personally, I see this USB remote for more of a gaming or activity on the computer where you want to be able to type quickly but get back to the main action (like using a controller). Which makes sense since you can use it on Windows laptops and desktops, the Xbox, or even the PlayStation according to the product description. 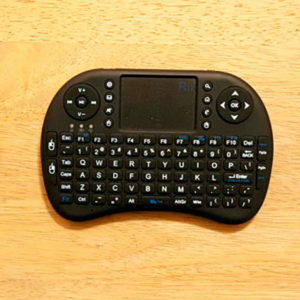 You can buy the Rii i8 Mini 2.4GHz Wireless Touchpad Keyboard on Amazon here.